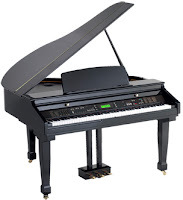 This is my prior review of Samick SG450 & SG110 Digital Baby Grands - Recommended - The Samick Piano Company is a well known South Korean piano & musical instrument manufacturer which has been making acoustic grand and upright pianos for over 50 years. Their line of acoustic piano products include the Samick brand as well as Kohler & Campbell, Seiler, Pramberger, Knabe, and others. Samick is also one of the largest guitar building companies in the world and has made thousands of guitars for famous companies including Fender, Gibson, Yamaha, and others and also builds the Greg Bennett and Silvertone line of acoustic & electric guitars. I have personally played on and owned Samick acoustic pianos in the past, as well as Samick made Greg Bennett guitars, so I am very familiar with their instruments and they are overall impressive for the price. Their newer digital pianos are also of higher quality and seem to hold up very well. So when it comes to the name "Samick," you may not have heard of that brand before, and in my opinion this is likely because they don't market and promote their products in a more aggressive way. They seem to focus their attention on the home piano market and families and they emphasize higher quality for a lower price. 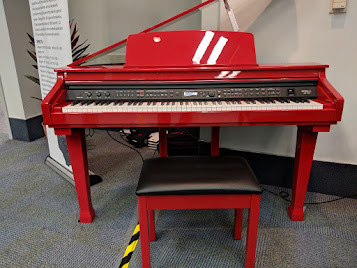 The Samick company (US headquarters Nashville, TN - left pic) has built many digital pianos over the years but were not very competitive with the other top piano companies like Yamaha, Kawai, Roland, or Casio. 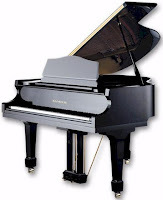 However, the Samick company has some very attractive & well built polished ebony, polished white and polished red small digital baby grand pianos in a lower price range all under $4500 store prices. I have played these Samick digital Baby Grands and liked what I felt and heard for the price. I was impressed by the fairly realistic hammer weighted key action which moved and responded to velocity and dynamics much better than other digital baby grands I have played in the lower price range. Beyond that, the piano tone was more realistic, although it wasn't quite up to the level of a Roland, Yamaha, or Kawai digital baby grand, but those brands are a lot more money in comparison (sometimes many thousands more). So for the money, the Samick digital grand pianos are quite sufficient in producing a satisfying piano playing experience for many people and they look great too. Two main reasons why I believe these pianos are worth consideration is because Samick has a business relationship with the Fatar key action company and the Orla digital design & sound electronics company, both of which are located in Italy. These two well known Italian companies have been designing quality digital piano components for many years and are respected in Europe and around the world. Samick is now using these two company's high quality (I have played them and they are really good) graded hammer piano key actions (with nice dynamic response) along with convincing stereo digital piano & instrument sounds and had them built into these models. 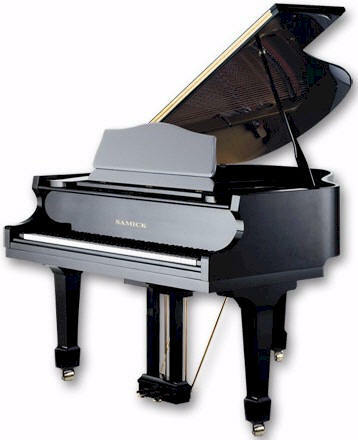 I believe the resulting outcome is that Samick has the best digital pianos they have ever offered and these instruments are at very reasonable prices for many people looking for a beautiful and well built furniture cabinet along with very good piano action, overall sound, and digital features. It is important to note the the Fatar key action company builds a variety piano key actions at different quality levels, so just because a piano brand says they use a Fatar key action does not mean that key action will necessarily be that good. Of the many Fatar key actions offered by that company, Samick is using their best non-wood key action (which costs more money but is noticeably better than the others) as opposed to the bottom of the line entry-level key actions used by some other brands. 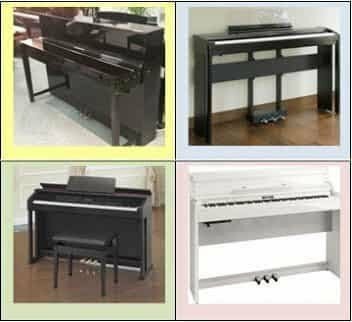 The lowest priced and smallest of these three pianos with a premium European Fatar key action is called the SG110 mini grand piano (left pic) and retails for about $3995US at Samick piano stores and generally sells for about $3500 discount price. The piano includes a matching bench and comes in 1 color finish which is the traditional polished ebony high gloss cabinet. The SG110 has 385 higher quality instrument sounds and 3 full size functioning brass pedals and the cabinet measures about approx 32" in depth from front to back so it can fit in many small spaces. The built-in stereo speaker system has 4 speakers going through 60 watts of audio power. This piano key action is very responsive and moves smoothly along with being quiet and the piano itself sounds quite nice for its size and really looks attractive. It is much better than those "off brands" I have played such as the ones from Costco and various big box music stores. The legs of the smaller SG110 sit directly on the ground and have no casters like it's bigger brother the SG450, and the inside soundboard area of the piano is all black in the polished black cabinet. The SG110 is more of a limited edition model and not always available from the Samick national factory warehouse. The SG110 piano also has 3 standard piano pedals, keytouch sensitivity control to change the touch response, headphone jacks for private practice, a user friendly backlit LCD display screen, dedicated front control panel buttons, and stereo audio output & input along with computer connections using both MIDI connectors and direct USB connection (see below left pic). There are also a number of other educational & fun features on these two models that in my opinion make these Samick pianos worth owning for many people. The pianos have attractive good looks including full sliding key covers, durable and higher quality rubberized control panel buttons instead of the cheaper and noisier plastic buttons found on lower priced pianos, and as I have mentioned before, the ability to have the piano lid open up with your choice of two height position levels (full or 1/2 open on the SG450), a matching padded bench, nice stereo sound, and Fatar's top of the line graded hammer piano key action. Along with some very cool digital features, I believe these small digital baby grand pianos are hard to beat for the money, especially in their price range. Samick's US headquarters is in the Greater Nashville, TN area and they offer an impressive 3 yr parts & 3 year labor warranty for in-home service good anywhere in the US. Based on everything I have seen and heard from these two pianos (and I have played them many times), I would recommend them, although for more advanced players with a larger budget over $6000, there are even better options, but you would need to spend quite a bit more money as I mentioned earlier. Finally, Samick makes a top of the line model called a SG450 (left and lower left pics - $4500 store price) that I spoke of earlier which has upgraded cabinet size & design, speaker system & audio power, General MIDI play/record features, and other functions. Two of the biggest upgrades in the SG450 includes the intuitive auto-arrangement chord features" and a much nicer, larger, and more intuitive user LCD display screen which allows you to see the variety of functions better. along with an easier to use control panel with upgraded quick access buttons. The SG450 also has 476 impressive instrument sounds (wow, how many can a person possibly need, but they are impressive) some of which are specialized orchestral sounds with velocity trigger points so that the sounds come in at different times depending on how hard you plays the keys. It also has 520 musically correct left hand chord accompaniment styles (1-finger/3-finger easy play) and helpful drum patterns for all styles of music, a right hand harmonizer note system when you play auto-chord style on the right hand. The auto arrangement chord system includes Classical, Jazz, Latin, Rock, Country, Big Band, Swing, Broadway, Ragtime, Gospel, Contemporary Christian, New Age, Christmas, Disney, and everything in-between. This kind of system is great for people who do not play piano and just want to have instant musical fun or for people who don't want to play in a traditional bass/treble clef style all the time but want to just use chord style playing even though they may play piano quite well otherwise. I personally like these playing options because I can play piano using both systems and the auto accompaniments sound so good that it's like being in the middle of a band or orchestra which follows how you play the piano and I enjoy that very much! There are other mini digital grand piano brands that have similar interactive chord features but the Orla designed instrument tones in the SG450 are vastly superior than anything else in its class. Other features include "continuous play music" using General MIDI song files playing from a USB flash drive (both Samick models can do this) which is great fun for just listening to your favorite music through the piano even if you are not playing it yourself. MIDI song files in all categories of music are available to purchase on-line so you can always get what you want and hear songs that you like. 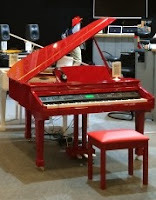 The SG450 also has real time volume controls over various functions in the piano, a variable brilliance control to get a variety of personalized acoustic piano sounds from mellow to bright, and a twin piano mode which electronically divides the 88 keys in half for two identical 44-key piano keyboards (with the same octaves and tuning) which is great for two people playing at the same time...very cool. This is definitely my favorite model but the SG110 is also impressive for what it does in a lower price range. The SG450 also comes in a limited edition custom polished red and polished white cabinet as well. Considering how heavy a regular small acoustic baby grand weighs, which is approx 600-800lbs, the lighter weight of these small digital baby grands makes them much easier to move and assemble than traditional pianos. The SG110 2'8" deep baby grand weighs in at 165lbs and the 4' deep SG450 (left pic) weighs in at 260lbs, so not bad considering their size. It's also important to know that on the more popular SG450 model, the hardware including pedals, knobs, wheels, etc are all in satin nickle which is very attractive especially in contrast with the black or white polished finish and the lighter color gray buttons on the control panel...looks very classy and elegant in my opinion:). But whichever Samick digital baby grand piano you may choose, I believe you'll likely have a good time playing it and be especially pleased with how they look. 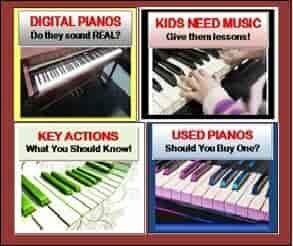 There certainly are better digital baby grands for piano tone, dynamics, pedal decay & resonance, key action, and other features from brands like Yamaha, Roland, and Kawai (again, as I mentioned earlier), but those pianos are a lot more money. Also, there are digital baby grands for less money such as Suzuki, Adagio, Artesia, and others, but I have not found any of them to be acceptable even at minimum standards. You just don't normally get something for nothing out there so it's good to be very careful when spending this kind of money. Samick piano company seems to be the one of the those manufacturers that has been able to fill a niche of offering higher quality digital grand pianos (especially with regard to key action and sound dynamics) at reasonable prices. 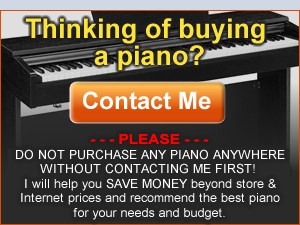 There are many things to think about when investing in a digital piano as well as many choices, and I can help you figure it all out if you contact me. 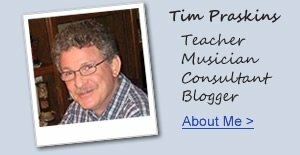 If you want more piano info and LOWER PRICES than internet discounts or sale prices, please email me at tim@azpianowholesale.com or call direct at 602-571-1864. * Also, below a video of the Samick piano and the guy playing it is a pretty amazing player so I hope you enjoy it. The model he is playing is called the SG310 which is discontinued, but the smaller cabinet SG110 is the identical piano in every way and sounds and plays the same although in a smaller cabinet. I have owned a Samick Digital Grand piano for 20 years (SGP-101). I have moved it all over he country and it works as well now as it did. I agree the keyboard hammer action is not realistic and after years of playing it it is difficult to adjust to a "proper" action. The voices are not wonderful, but adequate for my purposes. My observation is that for the small amount of money ($2200 in 1992) that I spent on it, it has provided hours of enjoyment with zero maintenance, always in tune (I am very sensitive to an even slightly out of tune piano to the point that no matter how wonderful the acoustics and action - I would rather play a decent digital piano any day to a piano that hasnt been tuned for a few months). I am continually amazed at how long it has lasted in essentially new condition. A couple of keys make a slight rubbing noise, but still dont stick. Given no other piece of electronics ever lasts more than 5 years, the fact that this product with its mechanical components has lasted 20 is astounding -- which I think speaks well of Samick's attention to detail and quality control. Very nice demo! I hope to be able to play like that some day. There's a lot of music in me and I love writing it too. I've heard the sg110 has been discontinued. Is this true? If not where can I get one in MD?